Great show tonight at The Palms Casino Resort in Las Vegas. ZZ Top put on on an incredible show and although Gregg Allman was supposed to open tonight, apparently he couldn’t make it so Kenny Wayne Shepherd stepped in and did an absolutely incredible job. I have have Kenny Wayne before and was really looking forward to seeing Gregg Allman as I have missed a number roof opportunities to see him in the past. If there is anyone who could have done a better job opening for ZZ Top than Gregg Allman, it would be Kenny Wayne Shepherd…what a great guitarist and performer. I had a VIP meet and greet package for the show tonight so had an awesome seat in the second row, dead center and nobody was sitting in front of me, so it was perfect view of the stage. 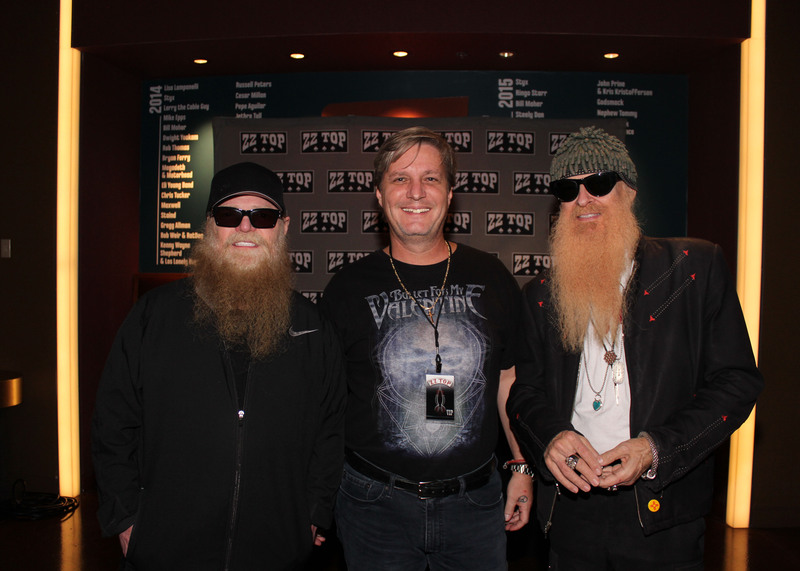 It was really strange as most of the meet and greets that I do (actually all of them) happen before the show, but as I was chatting with VIP hostess, she was saying that Billy Gibbons never understood why artists do pre-show meet and greets, and that after the show, and their performance is (what he feels) is the best time to meet the fans.. Anyway, they put on a great show and had a great set… they opened with Got Me Under Pressure, Waitin’ For The Bus and Jesus Just Left Chicago and proceeded to play all the greatest hits from their career. Some of my favorites were, I’m Bad, I’m Nation Wide and of course Cheap Sunglasses, Legs and Sharp Dressed Man. I think my favorites were La Grange and Tush which were their two encore songs. They also did a real good rendition of Jimmy Hendrix’s Foxy Lady. Another great show down here is Vegas.. Such a great place to come and see a show. Everyone has so much energy (or maybe it’s just that they are drunk 🙂 ) anyway, it was a good crowd and a great show. I’ll be back next weekend to see Billy Idol again.